“The Event. That was their euphemism for the environmental collapse, social unrest, nuclear explosion, unstoppable virus, or Mr Robot hack that takes everything down. “This single question occupied us for the rest of the hour. They knew armed guards would be required to protect their compounds from the angry mobs. But how would they pay the guards once money was worthless? What would stop the guards from choosing their own leader? The billionaires considered using special combination locks on the food supply that only they knew. Or making guards wear disciplinary collars of some kind in return for their survival. Or maybe building robots to serve as guards and workers – if that technology could be developed in time. “If, in fact, the man described here is Paul Linebarger (a.k.a. Cordwainer Smith), this strange, distorted sense of reality did little to hinder his success in the more conventional world that you and I inhabit. He earned a Ph.D. in political science at Johns Hopkins, and in his early life he mastered six languages. He served on the faculty of Duke University, advised the military on psychological warfare (and wrote a seminal book on the subject), did work for the CIA, and advised President John F. Kennedy. And those are merely highlights of his terrestrial CV. “Smith’s science-fiction work was obsessed with grand historical concepts and organizational philosophies, and describes in great detail command structures—in particular what he calls the Instrumentality of Mankind, a galactic governmental framework that recurs again and again in his work—and transformational epochs. A particular fixation of his was his projected future “Rediscovery of Man,” in which a technologically superior race of human beings deliberately renounces its advantages and blandly perfected lives in order to reintroduce risk and uncertainty into the sphere of day-to-day events. “What an odd change from those all-too-familiar sci-fi books about the future, in which some authoritarian dystopian society is postulated. Here instead Cordwainer Smith envisions a future in which the powers-that-be prefer to embrace a messy, uncontrolled imperfection. In an unusual twist on the typical futurist saga, Smith describes a fierce backlash against the grand achievements of the social engineers—but only because they have succeeded so completely. “The rulers now decide that they need to return to the less predictable ways of the past. Only 42 people in the entire universe know how to read English, that archaic language of a dead society, and a Common Tongue now allows universal communication, but that is now to be replaced by the reintroduced old languages. A host of other advances—medical, sociological, psychological, economic—are similarly seen as obsolete. Text: Ted Gioia, Remembering Cordwainer Smith: Full-Time Sci-Fi Author, Part-Time Earthling, The Atlantic. Image: Kazuya Akimoto, The Evil Eye, 2010. “A case has been described in which a mother believed her adult daughter had been replaced with a look-alike imposter. On delving into the patient’s history, it was found that the patient had to leave a very serious relationship with a man she loved because she was pregnant with another man’s child. The baby eventually grew into the adult daughter who the patient believed had been replaced. The patient’s resentment for having to leave her lover when she was pregnant was believed to be the psychodynamic source for the current delusion. “With Capgras syndrome, the family member who is believed to have been replaced is most often a spouse, parent, or sibling. For unknown reasons, the “replaced” family member is rarely the child of the delusional person and even more rarely is the child younger than 20 years. Although violence aimed at any person is a significant threat, violence aimed at children is particularly worrisome. Mary’s case is unique because the increased potential for violence in her relationship with her daughter needs to be taken into consideration when assessing the patient’s ability to be a safe and effective parent. “Although violence can be seen in all psychiatric disorders, there is a higher incidence of severe violence in patients with delusional disorders. In patients with Capgras syndrome, the violence is often directed at the imposter or, in some cases, the people the patient believes replaced the loved one with the imposter. “Bourget and Whitehurst found several demographic features that increase the likelihood of violence in persons with Capgras syndrome. Specifically, if the imposter lives with the patient or if the delusional person is male, has a persistent and long-term delusion, or has a history of violence or substance abuse, the risk of violence is increased. The sources of violence can be frustration or fear of the imposter, but it can also be cultural. Text: That’s Not My Child: A Case of Capers Syndrome, by Jeremy Matuszak, MD and Matthew Parra, MD, Psychiatric Times. “The belief that an event, a situation, or a set of people is controlled by unknown or secret forces, which usually have unsavory intentions. The conspiracies are supposedly intended to seize or hold political power, keep shocking information from the public, protect parties guilty of a crime, or overthrow social institutions. Conspiracies may be controlled by unidentified figures or by known institutions such as the CIA, the FBI, or the U.S. government; they may refer to known religious groups, such as Jews or Catholics, or they may assume an unprecedented new cabal; they may be attributed to aliens, communists, racial or ethnic minorities, or to a stranger. What all conspiracy theories have in common is the idea that common people have gained secret knowledge that a powerful elite is trying to keep hidden and that uncovering the conspiracy will help explain things that were previously hard to understand. “Conspiracy theories develop for several reasons. They are a way of making sense of information that is difficult to organize or comprehend. When logic and rationality do not provide a good story to explain something, conspiracy, attached to a series of seeming coincidences, can do the job. Events that appear random and hard to reconcile with known causes can be brought under control if a conspiracy is used to explain them. The effects of actions by large institutions, such as governments or corporations, are difficult to explain because of their complexity; conspiracy can account for their actions in a comprehensive way. Conspiracies are hard to disprove because any opposition to a conspiracy theory can be seen as another part of the conspiracy and as an element of a cover-up. “People’s desire to make sense of the social world is closely coupled with the extent to which they experience control over their environment. Various complementary theoretical perspectives, on meaning-making (Heine, Proulx, & Vohs, 2006; Park, 2010; Van den Bos, 2009), paranoia (Kramer, 1998), and compensatory control (Kay, Whitson, Gaucher, & Galinsky, 2009; Rutjens, van Harreveld, & van der Pligt, 2013), assume that threats to control increase people’s mental efforts to make sense of the social world, imbuing the world with meaning, purpose, and order. These insights may explain why conspiracy theories seem to gain momentum particularly following impactful societal events that are likely experienced as control threats by citizens (e.g., a terrorist strike, a war, or a natural disaster; see Pipes, 1997; Robins & Post, 1997; Shermer, 2011). Indeed, research reveals that people are more likely to attribute impactful, harmful societal events (e.g., a politician is assas- sinated) to conspiracies than societal events that are less impactful or harmful (e.g., someone tries to assassinate a politician but fails; see McCauley & Jacques, 1979), a finding that is attributable to people’s sense-making motiva- tion (Van Prooijen & Van Dijk, 2014). “In a similar vein, various operationalizations of control threats have been found to predict conspiracy beliefs. For in- stance, an external locus of control—that is, a dispositional tendency to believe that one’s outcomes are controlled by external forces—is correlated with interpersonal mistrust and paranoia (Mirowsky & Ross, 1983) and belief in conspiracy theories (Hamsher, Geller, & Rotter, 1968). Text: The Influence of Control on Belief in Conspiracy Theories: Conceptual and Applied Extensions, Jan-Willem Van Prooijen and Michelle Accker, Applied Cognitive Psychology, Appl. Cognit. Psychol. 29: 753–761 (2015). 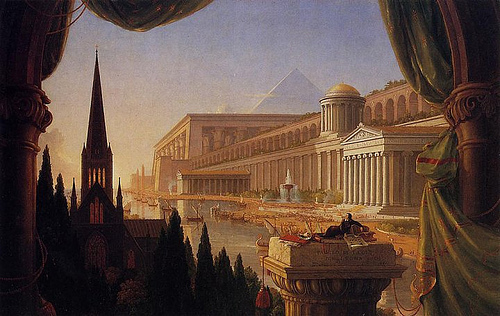 Pic: Thomas Cole, The Architect’s Dream, 1840.